Fans of Seth Rogen be weary. 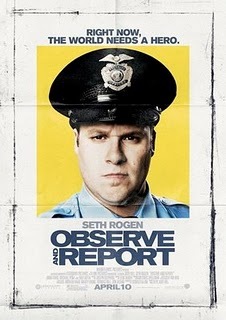 Observe and Report is not your typical Rogen film. While he exuberates his usual charm into an otherwise plain character, the movie as a whole seems to be lost in translation. It's a muddled mess of loosely connected scenes strung together to form what may be the remnants of a decent story for a 22 minute television program. Seth Rogen plays Ronnie, a mall security cop who takes his job way too seriously, even going so far as to believe he's a vital component to the stability and safety of the mall citizens. His dreary job finally becomes exciting when a naked pervert comes to town and starts to flash all of the female shoppers. Lucky for Ronnie, the flasher targeted the girl he is pining over, Brandi, played by Anna Faris, and he uses the opportunity to get closer to her and take down the flasher. Observe and Report has the comedy aspects down pat. When it comes to producing laughter, it succeeds more often than it fails. With more than a few belly laughs and plenty more amusing antics, the movie flourished in creating the audience giggle with glee. But jokes aren't this flick's problem. The story is a complete mess. Like a kid on a sugar bender, it's all over the place and never slows down until it crashes in the end from the constant high its been on. Unlike other Rogen films like Knocked Up and Superbad, the story here is uninteresting fodder, used only as a means for Rogen to slam down his usual shtick. While this works well for the comedic flow of the film, it doesn't help its overall quality. Few scenes had any type of continuity to make what was happening feel sequential. Instead, it felt jumbled, like I was watching a flick where the scene placement was irrelevant, just as long as the jokes kept flowing. You could rearrange many of the scenes in the movie and it wouldn't change a thing narratively. At first, I was enjoying myself too much to notice, but the movie doesn't take long to out itself under the weight of its own poor script. After the flasher plot is established, another plot reveals that somebody is stealing from the mall. What happens is that the film begins to ignore the flasher plot and starts to focus on the thefts, but no real conclusion is ever made. When Ronnie finally finds out who is stealing from the mall, the criminal knocks him out, flees to Mexico and is never seen again. Then it abruptly reverts back to the flasher plot. It felt like Observe and Report didn't have enough content to fill a feature length movie, so it injected an irrelevant side plot to ensure it reached an acceptable runtime. The bottom line is that the jokes usually land, but the story is a complete waste of time. Your decision to see this movie depends on whether or not you care about a meaningful story. If you like Rogen and want to see him play a slightly different character, a clumsy, delusional goofball who pledges and honors to uphold the law rather than break it (at least for the first half of the picture), and story arc means nothing to you, then you might want to give it a go. But despite my affection for the steady flow of laughs, the disarranged story killed any chance of me recommending Observe and Report.